Businesses of all sizes can make significant cost savings by focusing on waste in their business. Every business creates unnecessary waste. This can often be due to complacency and bad habits. 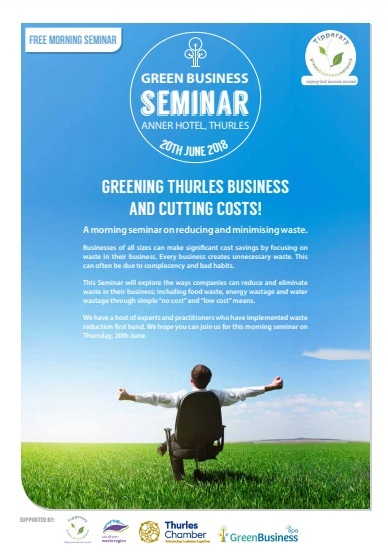 Thurles Chamber of Commerce in conjunction with Tipperary Green Business Network and the Greenbusiness.ie are hosting a seminar in Thurles on the morning of June 20th in the Anner Hotel to explore ways companies can reduce and eliminate waste in their business; including food waste, energy wastage and water wastage through simple “no cost” and “low cost” means. This will be a very worthwhile event for any business wishing to reduce utility costs. 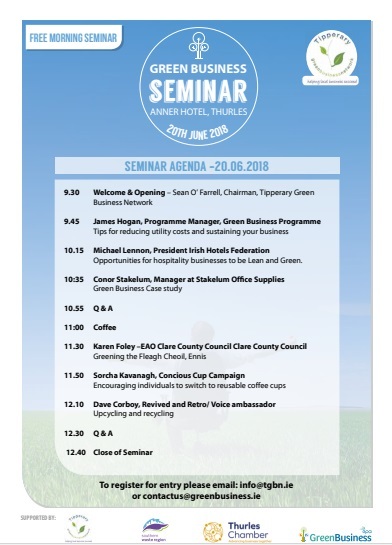 Businesses will hear from a number of experts and practitioners who have implemented waste reduction first hand, including Michael Lennon, President of the IHF and owner of the Westport Woods Hotel, Conor Stakelum, Manager at Stakelum Office Supplies, James Hogan, Green Business Programme, Dave Corboy, VOICE Recycling Ambassador and Sorcha Kavanagh, Conscious Cup Campaign. There will also be a very interesting presentation on how to “Green a Festival” from Karen Foley, Clare County Council who will outline how businesses and community pulled together in 2016 and 2017 to Green the Fleadh Cheoil in Ennis. Perhaps there is an opportunity for Thurles to Green its next major music festival, Féile- Trip to Tipp.